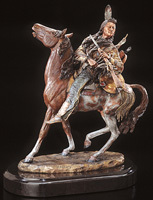 Horse Rider Sculptures - Click on an item for more details! 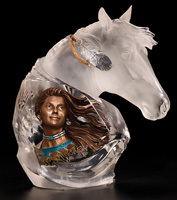 This "Visionary" Limited Edition Sculpture is created by Christopher Pardell. [View Artist Info] An image of an Chief Plenty Coups, armed with a rifle. He is a visionary for Indian pride and individuality. Bronze/Marble, 28 inches W. Limited Edition 350.